GUJCET Exam 2015 Notification – www.gseb.org: Gujarat Secondary and Higher Secondary Education Board has published press note for Gujarat Common Entrance Test 2015. Gujarat Education Board conducted Common Entrance Test for admission to Degree Engineering, Diploma/Degree Pharmacy as well as Medical Course after HSC Science Semester 4. This year GUJCET 2015 will be held on 07 May 2015. 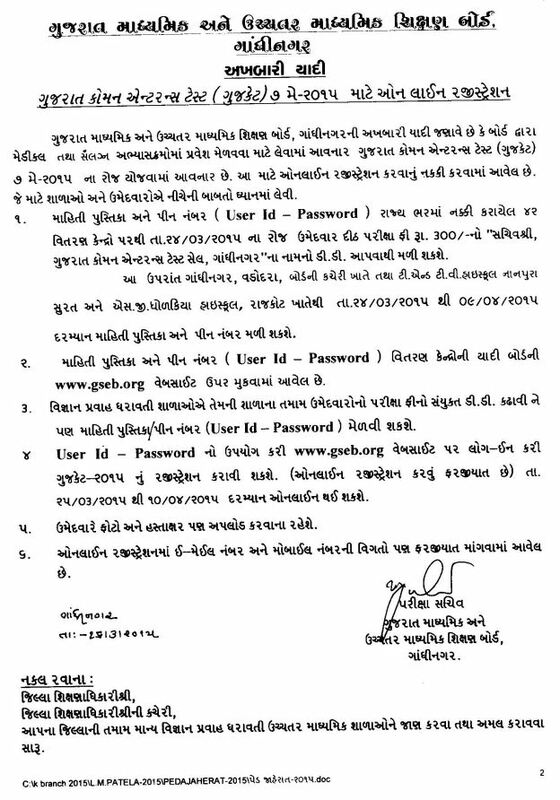 GUJCET Information Booklet and Pin No (User ID – Password) can be obtained from 24-03-2015 to 09-04-2015. List of distribution centers of Pin no and Booklet availble on Board’s Website www.gseb.org. GUJCET 2015 Online Registration will be start form 25-03-2015 to 10-04-2015. Download Full Press Note Form Below Link.